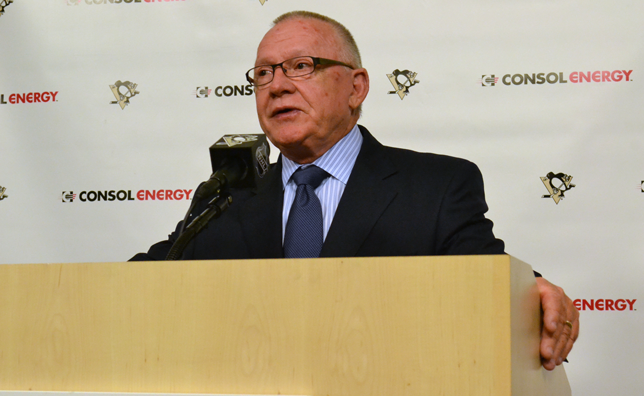 Jim Rutherford has been named General Manager of the Pittsburgh Penguins, it was announced today by co-owners Mario Lemieux and Ron Burkle. Rutherford, 65, one of the most respected executives in hockey, was general manager of the Carolina/Hartford franchise for 20 years and led the Carolina Hurricanes to the Stanley Cup in 2006. He stepped down from that position in April of this year. Rutherford was named the NHL’s Executive of the Year by The Hockey News in 2002 and 2006 and by The Sporting News in 2006. Under his leadership, the Hurricanes made two trips to the Stanley Cup final, won the Eastern Conference championship in 2002 and 2006, reached the conference finals in 2009 and captured three division titles. Rutherford played 13 seasons in the NHL as a goaltender, including parts of three seasons with the Penguins from 1971-74. A native of Beeton, Ontario, Rutherford was a first-round draft pick of the Detroit Red Wings in 1969 and played in the NHL from 1970-83 with Detroit, Pittsburgh, Toronto and Los Angeles. He appeared in 115 games with the Penguins, posting a 44-49-14 record and a 3.14 goals-against average. When his playing career ended, Rutherford joined the Compuware Sports Corporation as director of hockey operations in 1983. He oversaw youth and junior hockey for the Detroit-based company and was named general manager of the Windsor Spitfires of the Ontario Hockey League after Compuware bought the major junior franchise in 1984. He was honored as the OHL’s Executive of the Year in 1987 and 1988. Rutherford was named general manager of the NHL’s Hartford Whalers on June 28, 1994 and helped transition the club to Carolina in 1997. He also served as team president. Rutherford had been expected to continue in an advisory role with the Hurricanes until the Penguins opportunity arose. In his new position with the Penguins, he will also have the title of executive vice president. Jim and his wife, Leslie, have a son, James. Jim also has an adult daughter, Andrea.